According to Prevent Blindness America, there are more cases of cataracts than there are of glaucoma, diabetic retinopathy and macular degeneration combined. But despite how common cataracts are, there is still a lot of confusion about how they develop. Read on as the team at Berks Eye Physicians and Surgeons explains what causes cataracts. Most cataracts are caused by age-related changes that affect the lens, which is located behind the pupil and the iris. In a young, healthy eye, the lens is transparent, so light can easily pass through the lens and focus on the retina, where it is converted into nerve signals that are transmitted the brain. With advancing age, the lens can lose its natural transparency. Natural proteins that make up the lens can break down and clump together, creating cloudy areas. These clumps reduce the amount of light that reaches the retina and affect the clarity of images that do reach the retina. Cataracts start out small, only affecting a small area of the lens. But as they grow, their effects on vision increase and vision slowly becomes blurrier or duller. The lens also takes on a yellow or brown color, which causes vision to acquire a brownish tint. In the most advanced cases, this tinting makes it difficult to read and identify certain colors. When Does Surgery become Necessary? 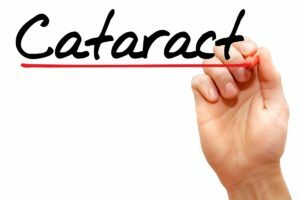 Early cataracts are less likely to interfere with vision and everyday tasks. But as cataracts mature and start to make driving, reading and watching television more difficult, it’s time to consider surgical treatment. During cataract surgery, the natural lens is removed from the eye and replaced with an artificial lens implant to restore clear vision. When performed by a qualified surgeon, cataract surgery is very safe and successful. To consult with the team at Berks Eye Physicians and Surgeons about your cataract surgery options, please call or email our practice today.